Nearly 60,000 prospective undergraduates applied for the fall 2016 quarter, an 8.8 percent increase from the previous year. 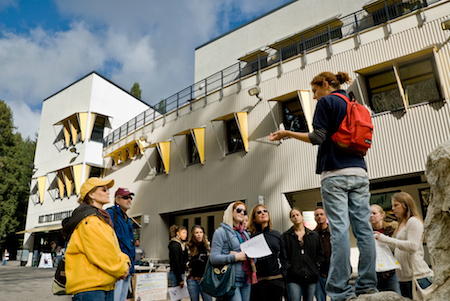 A record number of undergraduate students have applied to the University of California, Santa Cruz, demonstrating increased interest from California students and others from around the world for an education that offers hands-on learning opportunities often grounded in social consciousness. Interest from graduate students also continues to grow, though final numbers are not yet available. Last year, the campus received a record high of 4,316 graduate applications, and it is poised to exceed that figure this year. UC Santa Cruz attracted a record 49,133 applications from high school seniors and 9,969 applications from transfer students-also an all-time high-during the recent application cycle for a total of 59,102 applications, according to data released today by UC's Office of the President. The UC systemwide application deadline for high school seniors was Nov. 30. The transfer application was extended to Jan. 4. "It is gratifying to see such strong demand from our California students, as well as the increased demand from students from outside our state," said Michael McCawley, director of admissions. "UC Santa Cruz is definitely on a lot of students' radar these days, and for many of them, we are their top choice." UC Santa Cruz saw a 5.6 percent increase in the number of California high school seniors applying. Interest continues to increase from out-of-state students with a 13.5 percent increase and a systemwide high of 23 percent increase of applications from international students. Additionally, California transfer student applications grew by 12 percent, out-of-state transfer applications increased by 42.5 percent; and international transfer applications increased by 22.4 percent. "I am particularly thrilled to see the growth in transfer application numbers," said McCawley. "Transfer students know that our campus is committed to their success." There was also increased interest from ethnically diverse students in California. The campus received more freshman applications this year than last from African Americans (up by 11 percent), Asian Americans and Pacific Islanders (up by 4 percent), and Chicanos/Latinos (up by 8 percent), continuing its recent trend. American Indian freshman applications declined (down by 8 percent). Chicano/Latinos continue to make up the largest percentage of freshman applicants, followed by Asian Americans. A recent report by Time magazine listed UC Santa Cruz as one of the top 25 universities in the country that have diversified the most from 1990 to 2014. Additionally, UC Santa Cruz, which became a Hispanic-Serving Institution in 2012, received two grants last year from the U.S. Department of Education totaling $3.6 million that will support student success and retention. "Our campus has continued its efforts to attract students from underrepresented ethnic backgrounds, and I think the fall 2016 application numbers reflect those efforts. " McCawley said. "Of course, the important goal will be to have these application increases translate to enrollment increases next fall." McCawley cites the work of UCSC's faculty, students, alumni, and staff in attracting more diverse students to the campus. "Our partnerships with student leaders, our ethnic resource centers, and engaged alumni help to build interest from prospective African American, Hispanic, and American Indian students," McCawley added. UC Santa Cruz has recently expanded its academic offerings to give incoming students the opportunity to major in critical race and ethnic studies, part of the Humanities Division. The major will have students studying the dynamic power relations resulting from the cultural and institutional productions of the idea of race on a local, national, and global scale. UC Santa Cruz has also launched a new interdisciplinary undergraduate program in game design within the Arts Division that has students collaborating with peers in engineering for their entire academic career. Students in this new program will receive a degree focused on the design of game systems and other interactive experiences. Undergraduate students who arrive in the fall will be part of the campus's residential college communities for living and learning, as well as host of special programs, including the First Year Honors Program, Challenge Program, Smith Society, and ever expanding opportunities for undergraduate research, internships, and creative projects with world-class faculty. Like the eight other UC campuses that educate undergraduate students, UC Santa Cruz will aim to enroll more California undergraduates as part of UC President Janet Napolitano's plan to increase systemwide enrollment of California undergraduates by 5,000 for the coming academic year. Campus Provost/Executive Vice Chancellor Alison Galloway said a new initiative is underway to support undergraduates. "It is even more important to ensure that sufficient support is in place for students to be able to graduate on time and that such efforts are consistently coordinated with the work of our academic divisions," Galloway said. Galloway recently appointed Jaye Padgett, professor of linguistics, to serve as the interim vice provost for the Division of Student Success, focused on the academic success of all undergraduates including retention, time-to-degree, and graduation rates. The campus saw more than a 40 percent increase in the number of students interested in earning a degree in art, art history and visual culture, bimolecular engineering, or critical race and ethnic studies, all of which have seen more than a 40 percent increase from last year as desired majors. Economics, psychology, biology, sociology, and computer science continue to be some of the most popular majors for students applying. Undergraduate applicants will be notified of admission decisions beginning mid-March. Admitted first-year students have until May 1 to indicate their intent to enroll and transfers until June 1. UC Santa Cruz ranks second in the world for the impact of its research as measured by the average number of times its faculty's published work is cited by scholars around the world, according to a survey published by Times Higher Education. It also ranks first in the nation for the publication impact of the computer engineering Ph.D. program, by the National Research Council. Additionally, alumni have gone on to win six Pulitzer Prizes and five MacArthur "Genius" Awards.